CBSE will announce the Joint Entrance Examination JEE (main) 2015 results on 27th April 2015. There are 13 lakh students are waiting for the JEE Main Results in 2015. CBSE Will officially release the results on the websites jeemain.nic.in and results.nic.in. 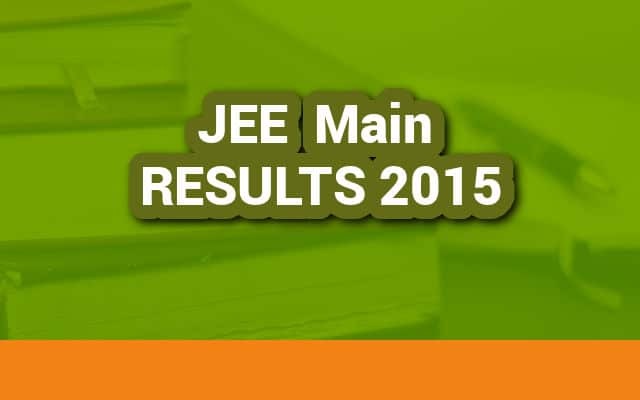 The JEE Main 2015 was conducted on 4th April 2015 on offline and 10 & 11th April 2015 on online examination. This year the score card will not be emailed to the candidates. So it is better to download the results from the website jeemain.nic.in. The marks of JEE 2015 is based on the marks obtained from Paper I and the JEE Advanced Exam 2015. So the Marks of JEE Main 2015 is critical on the final score card. There are 1.5 lakh students are selected from 13 lakh to JEE Advanced 2015 based on these scores. The JEE Advanced 2015 is scheduled on 24th May 2015. The Admission of IITs and ISM Dhanbad is based on the scores in JEE 2015. The score in class 12 Exam (Normalized) ( 40% Weightage) and JEE Main 2015 Score (60% Weightage) are required to prepare the final score. These scores are used to prepare seperate rank lists to various B.Tech., B.Arch cources in various IITs in India. The final rank lists are available on 7th July, 2015. All India JEE Rank, Category Rank and State JEE Rank are included in the JEE Rank Card. Also the total marks and marks in each paper are included in JEE Rank Card. The Rank card is available on the website after official declaration of results. ALL India Rank List is considered for admissions in NITs, IITs, CFTIs and SFIs. Also various engineering colleges are recruting based on the JEE Rank Card. All other details in the Rank Card is for informational purpose only. The states of Gujarat, Maharashtra, Nagaland and Odisha will also be accepting JEE (Main) 2015 scores.